Passenger Rail Safety | Operation Lifesaver, Inc. 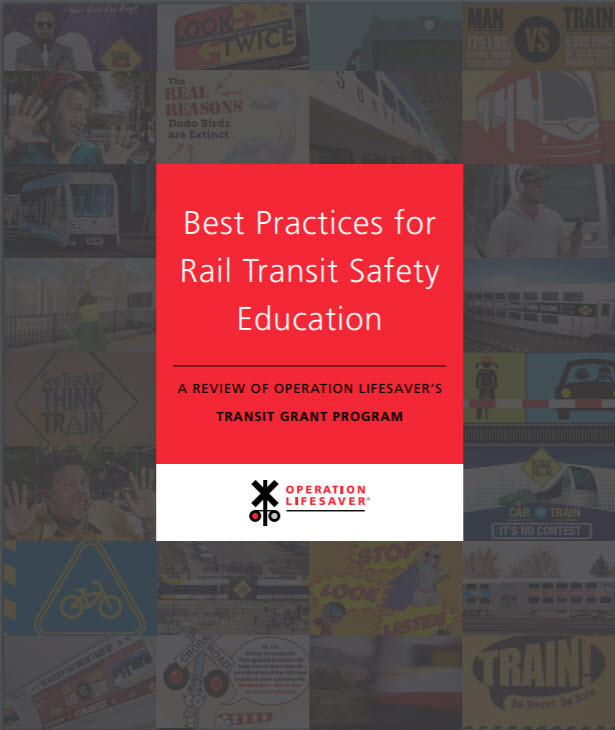 Learn more about the 2019 Rail Transit Safety Education Grants. See the sidebar block, right, for more information and links to Rail Transit Safety Education Grant documents. In America's cities and beyond, nothing connects us to work, play and each other like public transit, today's safest, most reliable way to travel. Passenger rail consistently offers people the safest transportation available. Ridership is projected to rise by 3.5% annually, nearly doubling over the next 20 years*. Sustaining that safety record is vital. Operation Lifesaver's free outreach programs offer drivers, pedestrians and communities critical rail safety education to stay safe around trains and railroad rights-of-way. The American Public Transportation Association (APTA) estimates that 35 million times each weekday, people use public transportation. Such heavy traffic means that incidents - people and vehicles colliding with public transit trains - sometimes happen. At Operation Lifesaver, we know that safety education can help prevent many of those incidents. Operation Lifesaver's partnership with the Federal Transit Administration (FTA), initiated in 2002, makes possible effective educational outreach programs for transit systems. New Jersey Transit's teen driving program, developed with Operation Lifesaver, teaches safe driving practices around trains and buses. Atlanta's Metropolitan Atlanta Rapid Transit Authority (MARTA) partnered with Georgia Operation Lifesaver on an awareness campaign warning distracted pedestrians to stay alert and stay alive. An aggressive public awareness campaign with Texas Operation Lifesaver before the opening of Austin's Capital MetroRail system helped with its incident-free start. This billboard, funded by an FTA/OLI mini-grant, was part of a safety campaign by the Denton County Transportation Authority in Texas. Rail safety education can, and does, save lives. Operation Lifesaver's goal is to help sustain passenger rail - affordable, accessible and reliable - as a leader in American transportation safety. The number of commuters is growing in the U.S. Learn what smart commuters do to stay safe. Operation Lifesaver distraction PSAs were featured in a safety campaign on Atlanta's MARTA transit system.